After twenty years apart the long-awaited reunion of Rik Emmett (guitar, vocals), Mike Levine (bass/keyboards) and Gil Moore (drums/vocals) took place at the Sweden Rock Festival in 2008. 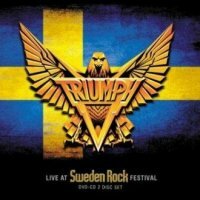 As Mike Levine recently said, ‘it’s great to finally be able to show the world Triumph’s reunion show at Sweden Rock, it certainly is one of the most memorable performances of our entire career’. And luckily somebody had the foresight to ensure that this momentous occasion was recorded for posterity. Quite why it has took this long for the recording to see the light of day is unclear, but better late than never! The DVD section is unavailable as a promo so I can’t tell you anything about it, but both that and the CD feature the entire Festival performance. And that performance is nothing short of fantastic, it really does sound as if they’ve never been away, the band (augmented by Dave Dunlop on guitar) firing on all cylinders as they reel back the years for a set full of classic Triumph anthems, with a good combination of the hit singles and popular album tracks. They kick off with ‘When The Lights Go Down’ (accompanied by a fusillade of explosions) and ‘Lay It On The Line’, then kick it up a gear for an awesome ‘Allied Forces.’ ‘Never Surrender’, ‘I Live For The Weekend’ and ‘Magic Power’ delve into the hits collection, while the lengthy Prog-based epic ‘Blinding Light Show’ certainly appeases the hard-core fans, and is a set highlight. They also squeeze in a cover of Joe Walsh’s immortal ‘Rocky Mountain Way’, a tune they first covered way back in 1978 that became the band’s first hit single. The main set closes with ‘Rock’N’Roll Machine’ that develops into a stunning Rik Emmett solo spot, then ‘Fight The Good Fight’ brings the set to a marvellous finale. Though rumours still abound of future Triumph live shows, it looks unlikely it will happen in the near future, so this little package could be the next best thing.